It has been quite some time since I had activated a SOTA summit so last night I planned a drive east to activate Mt Toorongo Range. I had to be up early to collect my son from his night shift at the nearby supermarket so the alarm was set for 5 am. After getting back home I decided that Mt Toorongo Range was to far too drive for just one 8 point summit so a quick plan was made to activate Mt Beenak and Hyde Hill, for a total of 10 points. Leaving home at just after 7:00, and following these directions, I was at the base of Mt Beenak ready to hike at 8:30. The hike up was easy going as the track is well used by the vehicles for the many services on top. I didn’t have my FT817 radio available so I had grabbed my FT450D instead along with a couple of 8400 mAh LiFePo4 batteries. After setting my linked dipole in the most suitable tree near the summit I set the RF power for 50 Watts, posted a spot on SOTAwatch and called CQ. The first QSO was with Ian VK5IS then Brian VK5FIMD and Nev VK5WG. Hearing a vehicle approaching I needed to leave the radio and drop one leg of my antenna that was hanging over the access track to allow a cherry picker truck to pass by. Once back on air I found the radio was dropping out on transmit due to low voltage. I backed the power off to 20 Watts and made contact with John VK5YW. A couple more CQ calls and the LiFePo4 battery had dropped below the voltage limit of the radio and the radio turned off and wouldn’t turn back on. This activation was now over as the battery I had carried up was nowhere near charged and the second battery was back on the car. Four QSOs is all I needed to qualify the summit for the 4 points but I really would have liked to start a bit longer and work the rest of the chasers. I walked back to the car and headed off to the next summit Hyde Hill. I had worked Hyde Hill about 3 years ago and remember it as being recently felled and cleared with access to the summit along the western edge of the logging coupe. After 3 years of regrowth the scene was quite different. VK3XDM has activated this hill in May 2016 by going up the southern edge but I couldn’t see where so I went with what I knew and took the western edge again. The accent is hard going and will get harder as the trees grow. As I climbed I followed the blue marker tapes on the trees which mark the edge of the coupe. I stopped 3 times to check my position on Androzic as I didn’t want to hike any further than absolutely necessary to get in the activation zone. It took about 45 minutes to get to the activation zone. When I was in the zone I set up on a stump with the antenna on a nearby tree. 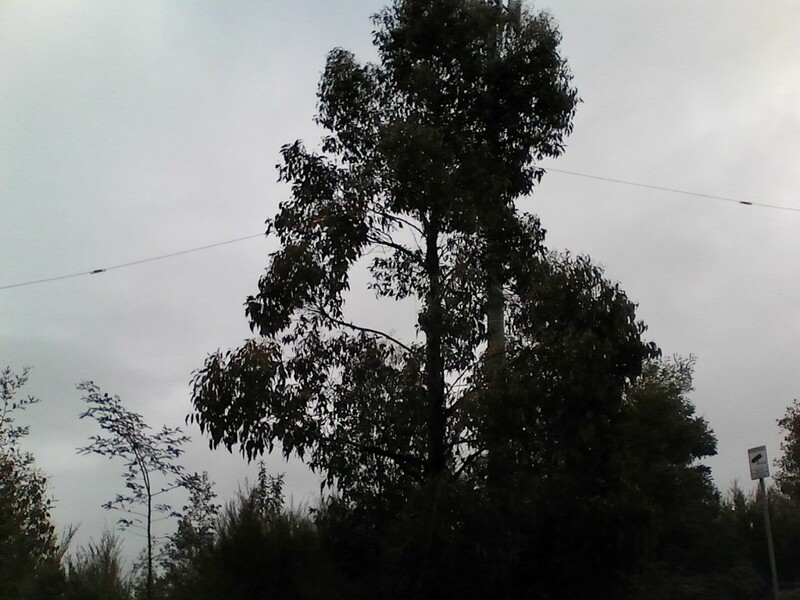 The antenna was not very high but the taller trees are further up the hill and was not heading any close to the top. Having a better battery I cranked the output up to 100 Watts, sent a spot and then worked the pile. Contacts came fast and I finished the activation with 31 calls in the log. One of the last calls was Mike VK3FCMC who was portable in the Kurth Kiln Regional Park, about 10 km south of me. I packed up at about midday and headed back down the hill. The descent was far easier than the way up and I was back after car in about 20 minutes. The Kurth Kiln Regional Park is on my way home so I stopped in and said hello to Mike and his son Luke. We chatted for about an hour and it was interesting to see how he was set up and to share a couple of tips with him. 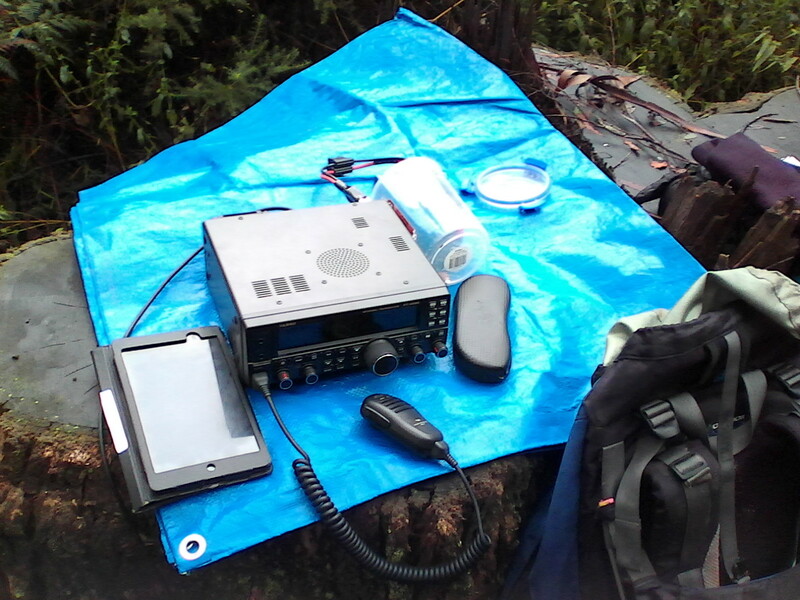 This entry was posted in Amateur Radio, FT450D, SOTA. Bookmark the permalink.